Based on the addition of WARC's 2019 ad industry forecast today, Research Intelligencer has updated its industry compilation, and the result remains essentially unchanged. After factoring for WARC's new projection, the consensus for global ad expansion among leading industry forecasters remains the same as the 4.1% we published December 3, 2018, when the major agency holding companies released theirs. Today's revised consensus also incorporates Dentsu Aegis Network's revised projections, released on January 11. 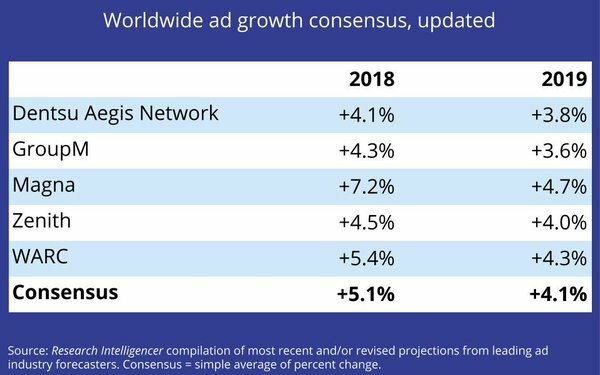 The addition of the most recent sources does bring down the 2018 global ad expansion consensus to +5.1% from 5.3% previously. It should be noted that each of these sources likely utilizes different methods, models and sources for calculating their estimates, but our belief is that compiling a simple consensus average is a reasonable way to baseline each entity's calculations against an industry norm. 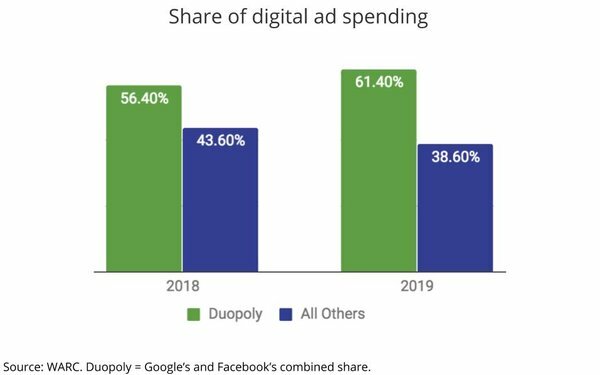 One surprising difference in WARC’s new estimates is its projections for global digital ad spending, which seems to contradict most other major industry sources, in that it projects the non-”duopoly” (Google and Facebook) portion will decline by 7.2%. While it’s true that Google and Facebook continue to dominate the share of the digital ad marketplace, their combined share is projected to decline as other sources -- principally Amazon -- take share. eMarketer recently projected Google’s share would decline one percentage point to 37.2% this year, while Facebook’s would expand 0.3% due mainly to growth from Instagram. By comparison, Amazon’s share of digital ad spending is projected to grow two percentage points to 8.8% this year. "The amount of ad money available to online publishers beyond Google and Facebook is now in decline, and the repercussions are potentially far-reaching, with several high-profile announcements of job cuts seen among online publishers already this year,” WARC Data Editor James McDonald said in a statement issued as part of today’s release, adding, “Print publishers have already been severely hit by the migration of ad dollars online, and while traditional media excluding print have fared admirably to date, their collective take of ad investment is also trending downwards."